Check out Tobi's Cherish Me Plunging Maxi Dress Gowned up and gorgeous with the Rose Cherish Me Plunging Maxi Dress. All you need for holiday party glam, the banquet dress has a deep plunge neckline to the waist, gathered long sleeves, and a flowy wrap skirt. Pair this thigh split dress with statement jewels and get set to wow this holiday. 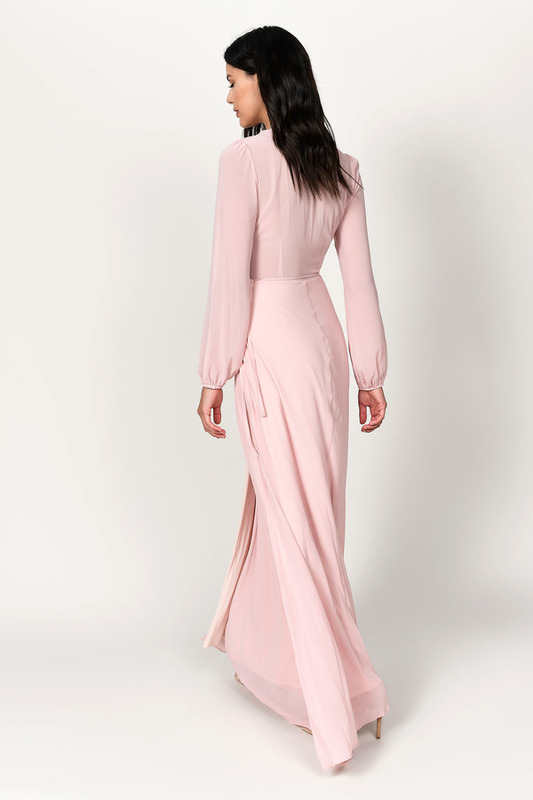 Gowned up and gorgeous with the Rose Cherish Me Plunging Maxi Dress. All you need for holiday party glam, the banquet dress has a deep plunge neckline to the waist, gathered long sleeves, and a flowy wrap skirt. Pair this thigh split dress with statement jewels and get set to wow this holiday. Gowned up and gorgeous with the Sage Cherish Me Plunging Maxi Dress. All you need for holiday party glam, the banquet dress has a deep plunge neckline to the waist, gathered long sleeves, and a flowy wrap skirt. Pair this thigh split dress with statement jewels and get set to wow this holiday. Gowned up and gorgeous with the Ivory Cherish Me Plunging Maxi Dress. All you need for holiday party glam, the banquet dress has a deep plunge neckline to the waist, gathered long sleeves, and a flowy wrap skirt. Pair this thigh split dress with statement jewels and get set to wow this holiday. Gowned up and gorgeous with the Slate Cherish Me Plunging Maxi Dress. All you need for holiday party glam, the banquet dress has a deep plunge neckline to the waist, gathered long sleeves, and a flowy wrap skirt. Pair this thigh split dress with statement jewels and get set to wow this holiday. Model's profile: height 5'9", bust 34", waist 24”, hips 35"
Ivory, Rose, Slate modeled on a size Small.